"WHEN THE PAST WON’T LET YOU GO, LET LOVE SEE YOU THROUGH..."
Happiness”).Starring RUSSELL CROWE and AMANDA SEYFRIED, it is based on a 2012 script written by Brad Desch. The story follows a father and daughter living 25 years apart in New York City. Russell Crowe will portray a famous novelist and widower struggling with mental illness as he tries to raise his 5-year-old daughter. Amanda Seyfried will portray the now-grown daughter in present-day Manhattan as she battles the aftermath of her troubled childhood. 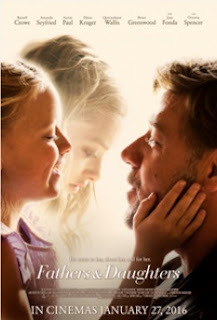 Fathers And Daughters will be in the cinemas on January 27, 2016.